Nearest weather station, with distance and direction from RNA: The nearest weather station is at the Ashe Nursery, located five miles (8 km) southeast of the RNA. Maximum and minimum temperatures: The climate of the Granny Creek Bay RNA is characterized by mild winters and hot summers. The mean temperature in August is 79°F and in January it is 49°F. Elevation: The elevation of the area ranges from 140 to 270 feet (43 to 82 m). Geology and Soils: The geology of the area consists of marine sediments of recent, pleistocene, pliocene and miocene origin. Benndale, Mc Laurin and Heidel soils, which are gently sloping to steep, well-drained, loamy and sandy soils, are found on the uplands in this area. Poarch, Susquehanna, and Saucier soils are also found. Trebloc and Latonia soils, which are nearly level, poorly drained and well drained, silty and loamy soils, are found on terraces and floodplains. Aquatic Features: Small seeps and an underground stream form the stream that flows through the bay. In the bay, the stream separates into small streamlets. An underground spring provides sufficient water that the substrate is covered by stream water year round. Plant Communities: Granny Creek Bay is a hardwood bay bordered on three sides by slopes with stands of loblolly pine (Pinus taeda) and slash pine (P. elliottii). The northern end of the site is bordered by a mixture of hardwood trees and shrubs. A population of grass of Parnassus (Parnassia grandifolia), grows in and around the stream that flows through the bay. (Eakes, 1989). Plant diversity of the area is high and fifty–one plant species have been identified in the bog area. 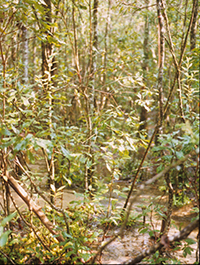 Dominant tree species include swamp cyrilla (Cyrilla racemiflora), yellow–poplar (Liriodendron tulipifera), sweetbay (Magnolia virginiana), and blackgum (Nyssa sylvatica var. biflora). At Risk Species: The RNA will provide habitat for several rare species, such as the gopher tortoise (Gopherus polyphemus), a threatened species; the grass-of-Parnassus, a rare plant in the South and Peltandra sagittifolia, a locally rare plant. Common Shrub Species: Common tree and shrub species in the understory include buckwheat tree (Cliftonia monophylla), large gallberry (Ilex coriacea), Florida anise tree (Illicium floridanum), Virginia willow (Itea virginica), and evergreen bayberry (Myrica heterophylla) (Eakes, 1989). Common Herbaceous Species: The ground cover consists primarily of grass-of-Parnassus (Parnassia grandifolia) and butterwort (Pinguicula primuliflora). When the water level decreases, a sedge Rhynchospora sp., Lobelia species and other herbaceous plants increase in abundance. Small mats of spaghnum (Spaghnum sp.) are encountered occasionally and mats of stream bogmoss (Mayaca fluviatilis) can be found on the western edge of the site. Common Mammal Species: The RNA includes several active burrows of the gopher tortoise, a threatened species. There is a community of more than three dozen animal species that make use of gopher tortoise burrows for shelter.